A month or so ago, a group if my Twitter pals got to talking about our doughnut pans (because, well, that's the kind of thing we talk about). We decided it would be fun to use our pans more frequently, and, thanks to Kayte, our doughnuts for weekend mornings pinterest board was born. Baked doughnuts clearly fit in with a weekend full of baking, but they are also quick and easy enough for a busy morning. 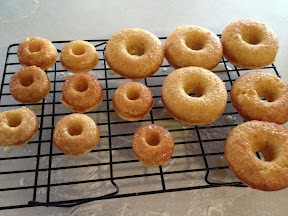 Mix the batter while the oven preheats, make the glaze and do the dishes during the eight minutes of baking time: 30 minutes tops between deciding we need a breakfast treat and enjoying fresh baked doughnuts...can't beat it! And easy enough for the kiddos to make, with a little bit of help. First up were these pumpkin doughnuts from KAF, a clear favorite with everyone. I used half the batter to make 6 regular and 6 minis on Saturday morning, stuck the rest of the batter in the fridge over night, and made the rest on Sunday morning. Easy to do and way tastier than eating day-old donuts! 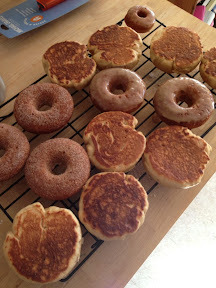 We topped these with cinnamon-sugar (although the little girl preferred them plain). 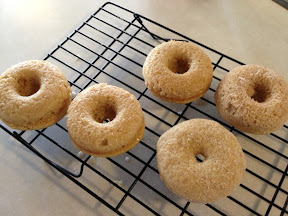 Next, we made apple cider doughnuts, also from KAF. These were my least favorite, but hubby said that, with the glaze, they tasted like apple pie wrapped in apple pie. We used half cider glaze (powdered sugar, milk, boiled cider) and half cinnamon sugar. Last week were citrus doughnuts: officially orange, but I think some of my orange zest from the freezer may have been lemon zest...who knows. I used a little extra zest and used orange juice for half the milk in the glaze. Yummy. Today we had simple spiced doughnuts. Based on Kayte's experiences, I made a half recipe, but used the full amount of spice. I also used Kayte's glaze (powdered sugar, milk, cinnamon, and vanilla) for half; cinnamon sugar for the other half. 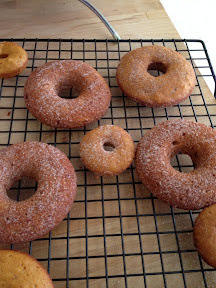 A half recipe made five doughnuts, but it's clear I overfilled my pans, so I'll make six next time. It's fun to get more use out of a specialty pan, and I can't wait to see what gets chosen for next weekend! I love twitterbakes. When I heard that Kayte, Margaret, Nancy, and Di were all going to bake Rebecca's family challah recipe one Sunday, I just had to jump on board. Most of the challah recipes I've tried have just tasted like enriched white bread; the only one that tasted like real challah was the very first one I tried, Joan Nathan's recipe via Smitten Kitchen. It was so fun to get challah updates throughout the day and to read about everyone's different braiding experiences. Due to house guests, I was behind most everyone else, but finally finished my bread late Sunday night (mine did not take the full 30 minutes to bake). This bread was fabulous; the flavor was spot-on challah. We nibbled on slices plain for a snack, and then enjoyed a big dinner of French toast. 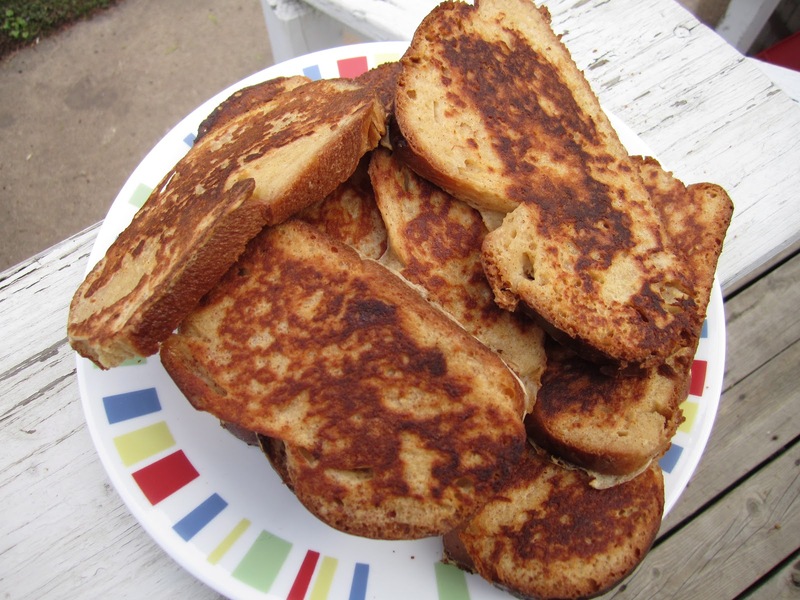 The kids brought the rest of the loaf to Grandpa Daycare the next day for a French toast breakfast. Rebecca posted her challah just in time for the Jewish New Year....L'Shana Tova! This whole wheat dough was gorgeous and so easy to work with.....I only had 13 ounces of whole wheat flour, so I used white whole wheat for the other 2 ounces required, and I used bread flour for the rest. Using the info at the beginning of the book, I weighed out the flour, using 5 ounces for each cup of flour. The measurements were just perfect; I didn't have to add anything else. Because I needed to start making school lunches, I decided to make rolls for lunch sandwiches. My little guy is in his first few days of kindergarten. (sniff) I made nine 3 1/2 ounce rolls and then froze the other half of the dough to use some week when I'm too busy to bake. Unfortunately, my little guy didn't like the bread. He hates honey with a passion, and could even detect the small amount in this bread. So I ended up making simple white whole wheat buns for his school lunches. But luckily, hubby and I thought the flavor of the bread was outstanding, and hubby happily ate the rest of the buns for his school lunches for the remainder of the week. The cool breeze in the air (it was in the 40s when we got up this morning!) 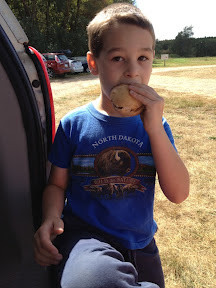 makes me anxious for fall baking, and we started today with these pumpkin donuts from KAF. With school back in session, my free time to browse magazines and websites for veggie recipes is just about zero, so I was beyond excited to see a recipe in my newest issue of Cook's Illustrated (the iPad version, which I just love!) that used up almost every single vegetable from this week's box: eggplant, summer squash, tomatoes, bell peppers, onions, basil. I was a little skeptical because the recipe didn't call for any typical soup filler: no meat, no beans, no pasta. Still, I wasn't going to pass up a perfect opportunity to use up my veggies. I made the soup this morning; as long as it called for a 20 minute rest to "let the flavors meld," I figured it wouldn't hurt to let it rest all day. Besides, soups are usually better when they're reheated. 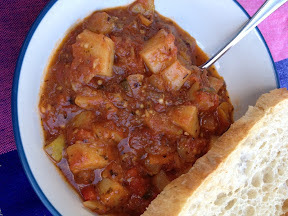 The flavors in this soup were just amazing, so complex and interesting; it has to be one of my favorites ever. 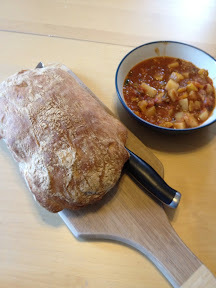 I served it with cheese, fruit, and ciabatta from ABED. A perfect summer-turning-to-fall dinner. I adjusted quite a few of the ingredient amounts because I just used what I had in the fridge. I get the feeling that this is quite a flexible recipe, and I would happily make it again with whatever amounts of the veggies I receive next week. 1. Process the first five ingredients (basil through red pepper) in the food processor to make a paste. 2. Toss the eggplant with 1tsp salt and lay on a plate covered in coffee filters. Microwave on high until shriveled, about 8 minutes, tossing half way through. 3. Heat 1 T oil in a large dutch oven over high heat. Cook eggplant, potatoes,and onion for 2 minutes, stirring frequently. Push veggies aside and add 1 T and the tomato paste, cooking until the tomato sauce starts to brown, 1 or 2 minutes. Stir the sauce in with the veggies. 4. Add the tomatoes, tomato juices, and water to the pot, and bring to a boil. Turn down to medium, cover, and cook for 20 minutes. 5. In a large skillet, heat 1 T of oil over medium-high. Add the peppers, squash, and 1/2 tsp salt. Cook for 10 minutes, until veggies are browned and softened. Push them aside and add the paste from step 1. Cook for a minute until fragrant, and then stir it in with the veggies. 6. Turn off the heat on the soup and then add the squash/pepper mixture. Pour a little liquid from the soup into the skillet and use it to scrape up any browned bits; stir those in to the soup, too. 7. Cover and let the soup rest for 20 minutes, or refrigerate until later in the day. Add fresh basil before serving.